Game Sevens: Will the NHL finals series match the NBA and go 7 games? 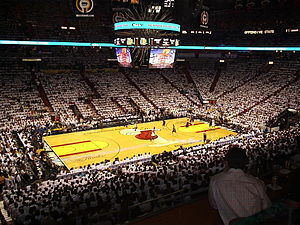 The Miami Heat and San Antonio Spurs took their NBA Finals series to a Game Seven with the Heat winning their second straight title. Now the question is: Can (or will) the Chicago Blackhawks and Boston Bruins take their Stanley Cup series to a seventh and deciding game? For the record, this was the 18th Game Seven in NBA Finals history and the first since 2010 when the Lakers beat the Celtics in seven games. If you compare the three professional leagues that have a seven-game finals playoff (major league baseball, the NBA and the NHL), the NHL has had the fewest Game Sevens since 1947 (when all three leagues were in existence at the same time) with 14. Major League Baseball has had the most Game Sevens with 26 since ’47. Only once since 1947 have all three sports had a Game Seven decide their champion. That happened in 1955. The Brooklyn Dodgers defeated the New York Yankees in seven games to win the ’55 World Series; Syracuse won the NBA title in 1955 winning the championship in a seventh game victory over Ft. Wayne; and Detroit won the ’55 Stanley Cup playoffs over Montreal by winning Game Seven. Other than 1955, there have been a handful of times when two of the three sports saw their title series go the distance with seven games. Major League Baseball and the NBA have gone seven games in the finals in four seasons (1952, 1957, 1960 and 1962… note it hasn’t happened in over 50 years); the NHL and MLB have gone seven games in the finals in six season (1964, 1965, 1971, 1987, 2001 and 2011). Trivia answer: The last time the NBA and NHL final series both went seven games in the same year was in 1994. The Houston Rockets won the NBA title with a Game Seven win over the New York Knicks, and the New York Rangers won the NHL title in 1994 by defeating Vancouver four games to three. That’s the only other time other than 1955 that the NBA and NHL have seen their championship series decided in seven games in the same year. One more stat: Although the NHL has had the fewest Game Seven final series since 1947, they have had the most since 2000. Since 2000 the NHL has had six finals series go the distance with seven games (it could be seven years if this year’s Chicago-Boston finals goes to a seventh game). Both the NBA and Major League Baseball have seen a seventh game finals series in three years.